I haven't been able to stop thinking about the book Free to Learn. I read the book a few weeks ago and have found myself quoting it an awful lot. Much of what the author was saying about schools, learning, and children's passions struck a chord with me. I found myself wanting to copy many whole paragraphs onto my blog to share with you all. While the author is not a homeschooling advocate or parent he began researching how children learn and the importance of play when his own son became disenchanted with the public school system. The author's son ended up attending a Sudbury school which sounds amazingly like unschooling. The book came at a time when I really needed to be reminded of this tried and true method of how children learn. 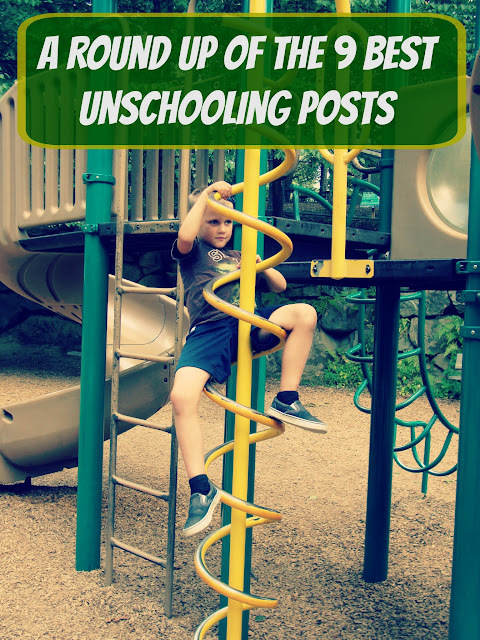 During the summer we tend to fall back into an unschooling routine for our learning. This year I was feeling guilty for taking time off and I've been forgetting that even though I'm not teaching they're still learning. I often feel like if my boys aren't learning traditional school type subjects then it doesn't count or they aren't really learning and this just isn't the case. Perhaps that why this quote: "In this day and age, nobody can learn more than a sliver of all there is to know. Why force everyone to learn the same sliver? ... when children are free to follow their interests, they take diverse and unpredictable paths. They develop passionate interests, work diligently to become experts in the realms that fascinate them, and then find ways to use their skills, knowledge, and passions to make a living" stuck in my head. I was reminded that I have no idea what skills will be most useful to them or what jobs will be available when they grow up. I need to focus on fostering a love of learning, protect that rampant curiosity from dying out, and allow them to lead me in what we do each day. Brainstorming Unschooling Projects: Everything from playing board & card games to building with Lego sets. I tried to tie in all the various ideas to traditional school subjects too. Teach a Man to Fish-- my musings on the importance of teaching children to do for themselves instead of doing for them. To teach or not to teach... that is the ?-- a blog about how children do not retain facts that do not interest them or relate to their lives. Science, Math, Reading-- think we covered it all today-- another typical unschooling day in our house. They're JUST Playing-- a blog about a field trip we took complete with lots of quotes about the importance of play & brain/ child development. Screens for Learning-- a list of computer, kindle, and Wii games my boys use for learning. If they're going to spend extra time on screens this summer I need to remind myself that there is a benefit in that!